What is AgileAssets Software Platform? AgileAssets Software Platform is a comprehensive and fully integrated infrastructure asset management solution built to assist public and private organizations in dealing with the challenges associated with managing their infrastructure assets, complying with regulations, intelligently allocating budgets for instrasture asset-related projects and activities, and building plans and strategies that will give them higher ROI. The solution permits users to completely handle the lifecycle of their infrastructure assets, covering purchasing, maintenance, and replacement or disposal. AgileAssets Software Platform comes with modules that are utilizing analytics technologies; enabling organizations to leverage their asset data, analyze various scenarios, and come up with smarter decisions for implementing maintenance, rehabilitation, and reconstruction programs that take into account their budgets. AgileAssets Software Platform delivers tools which can be accessed and operated from a web-browser. These tools are designed to simplify the management of different aspects of infrastructure maintenance which include planning, inspection, work order management, and reporting. The solution can also be integrated with various systems such as GIS/LRS systems, ERP solutions, financial programs, and HR applications. Last but not least, AgileAssets Software Platform offers a set of mobile infrastructure management solutions which allows users to capture and report field data; create, view, and edit work orders; manage asset inventory, and perform fleet maintenance all from their mobile devices. AgileAssets Software Platform improves how organizations come up with decisions as they manage their infrastructure assets. These assets include roads, bridges, facilities, vehicles, telecom, traffic signals and signs, and infrastructure technology services (ITS). Some organizations need to implement infrastructure asset-related programs with a limited budget so they have to allocate their budget intelligently in such a way that they will be able to formulate the right and best strategies and plans despite budget constraints, guarantee asset performance, and generate the highest possible ROI on infrastructure asset investments. The infrastructure asset management solution is equipped with four analytics modules that help organizations generate data-driven decisions and manage their infrastructure assets smartly, efficiently, and effectively. One of those modules is called the Portfolio Analyst. Portfolio Analyst provides an executive-level infrastructure asset analytics solution that enables organizations to intelligently allocate funding and budget to different programs and assets. The module permits them to set up and analyze different “what-’if” scenarios in multiple time frames, encompassing both short-term and long-term. They can also analyze these scenarios by applying budget constraints. As they analyze the scenarios they set up, users will be able to select specific projects and budget allocation strategies that will give them the highest ROI. Then, they can create reports to highlight asset conditions that demand maintenance and rehabilitation, and to substantiate the required budget and funding for those projects. Another analytics module offered by AgileAssets Software Platform is the Pavement Analyst. Like the Portfolio Analyst, this module supports the analysis using “what-if” scenarios, the application of intelligent budget allocations, and the creation of reports.. However, there is feature unique within this module, as it is exclusively built for generating decisions for pavement maintenance, preservation, rehabilitation, and reconstruction projects. Pavement Analyst applies predictive modeling wherein users will be able to forecast how specific pavement areas will deteriorate over a range of time. This way, they can determine what type of pavement maintenance and treatment plans and strategies they need to implement to address the predicted issues and when is the best time to implement them. AgileAssets Software Platform provides an analytics module dedicated to the maintenance, preservation, rehabilitation, and reconstruction or replacement of bridges. This module is called the Bridge Analyst. With this module, users will be able to assess the condition and performance of bridges and access inventory data. Then, the module permits them to prepare work plans which will enable them to hit the performance targets they set up without requiring them to exert a lot of efforts and allocate a big chunk of their budget. Lastly, the platform comes with an analytics module used for implementing road network safety programs, letting users decrease the number of accidents, liabilities, and property damages across their road network. Named as Safety Analyst, this module allows users to perform advanced analysis using GIS (Geographic Information System) and LRS (Linear Referencing System). Here, they can visualize and leverage their data on safety issues which include collision types, traffic and crash information, and hotspots within GIS and LRS-based maps. This will help them come up with safety plans and countermeasures which they can use as a basis for analyzing the performance of their road network assets later on. 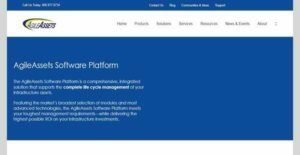 AgileAssets Software Platform streamlines the process of managing the lifecycle of infrastructure assets. The solution ensures that organizations can efficiently and effectively handle the entire lifecycle of their assets, from the moment they acquire them until the time they decide to replace or dispose them. Also, it enables them to consistently check and confirm that their infrastructure assets are adhering to local, state, or federal laws and regulations. Infrastructure asset maintenance is a key feature available in AgileAssets Software Platform. With this feature, organizations can comprehensively manage all maintenance activities and workflows related to their assets through the aid of its browser-based tools. Although asset maintenance is a complicated process, the tools are designed to make it as simple as possible. Whether users are creating maintenance plans and preparing budgets for such plans, performing an inventory, conducting infrastructure asset inspections, creating and assigning work orders for maintenance activities, capturing maintenance activity details, checking warranties, or generating maintenance reports; the platform makes sure that they can handle any of these aspects efficiently. AgileAssets Software Platform can seamlessly work with other systems, solutions, and applications so users can establish a seamless collaboration among their teams and departments, make infrastructure asset data more accessible to everyone, and engage with stakeholders better. The solution can be integrated GIS/LRS, financial, ERP, HR, data warehouse, purchase management systems as well as with tools that are running the legacy system. To wrap it up, AgileAssets Software Platform is equipped mobile infrastructure asset management solutions which are ideal for employees and team members who are working in the field. Indeed, the platform’s web-based interface is optimized for Android and iOS devices, giving full touchscreen capabilities. Among its mobile solutions is a mobile app called Field Data Collector. This app is ideal for conducting on-site inspections, managing asset inventories and transfers, accessing and updating vehicle information, and capturing data on field works. Moreover, this mobile app is built with online and offline system which works on Windows-based laptops and tablets. With such system, field employees can still work using the app even if they don’t have an access to the Internet. Once they are able to connect to the internet, all the data they captured and activities they made while offline will be updated and synchronized throughout the online system. If you are interested in AgileAssets Software Platform it may also be a good idea to analyze other subcategories of Best Fixed Asset Management Software collected in our database of B2B software reviews. Every company has different wants and needs a software that can be personalized for their size, kind of employees and clients, and the specific industry they are in. For these reasons, no software can offer perfect functionality off-the-shelf. When you try to find a software system, first be sure what you require it for. Read some AgileAssets Software Platform reviews and ask yourself do you want basic functionality or do you require complex tools? Are there any industry-specific tools that you are searching for? Get the answers to these questions to aid your search. There are multiple aspects that you need to reflect on and these include your finances, specific business wants, your company size, integration needs etc. Take your time, check out a few free trials, and finally choose the app that offers all that you need to enhance your firm efficiency and productivity. How Much Does AgileAssets Software Platform Cost? Contact the vendor for their SMB and enterprise pricing plan details and other product information. We realize that when you make a decision to buy Fixed Asset Management Software it’s important not only to see how experts evaluate it in their reviews, but also to find out if the real people and companies that buy it are actually satisfied with the product. That’s why we’ve created our behavior-based Customer Satisfaction Algorithm™ that gathers customer reviews, comments and AgileAssets Software Platform reviews across a wide range of social media sites. The data is then presented in an easy to digest form showing how many people had positive and negative experience with AgileAssets Software Platform. With that information at hand you should be equipped to make an informed buying decision that you won’t regret. What are AgileAssets Software Platform pricing details? What integrations are available for AgileAssets Software Platform? AgileAssets Software Platform supports integration with GIS/LRS, financial, ERP, data warehouse, purchasing, human resources systems as well as with legacy management systems.